This morning, I stole a sweater off of a weimaraner. It was a mint green cable knit. It was nicer than most of my sweaters, but it wore a little snug in the shoulders. On me it was snug; it seemed fine on the weimaraner. My morning walk was freezing. I'd misheard the weather report, and I had on only a flannel button-down and my fall jacket. That’s when I passed a weimaraner wearing that fancy sweater. It’s easy to steal from dogs. I just rubbed its belly until it rolled over, and I slipped off the knitwear. Its owner never noticed. He was on his Blackberry. Like I said, the weimaraner’s sweater was nice. I thought at the time it was cashmere, but someone later told me it was chenille. (I’m not dumb; I just invert words sometimes.) The sweater wasn’t very warm, though. On my body, it fit more like an open-front vest. So, I stole another dog sweater. The second one was off a greyhound. It was tan with gray accents. Not the sweater; the dog. Its sweater was purple with a cowl neck and an oversized argyle. I slipped that one and the weimaraner’s sweater over my sleeves as a kind of a makeshift dancer’s shrug. It cut the cold, but by then I had gotten a taste for crime. I went around the rest of the day stealing dog sweaters, one at a time. I called in sick to work. I think they heard the el train in the background, but I was too busy casing my next mark to worry about it. There was a dachshund hanging around the edges of a dog park near the Natural History Museum. It had on a red Christmas-y wool. I thought it might make a good scarf. I was right. It was all so easy. A bit of kibble here, a scratch behind the ear there—like taking candy from a baby. Except the candy was sweaters, and the babies were dogs. Only a poodle/spaniel mix gave me any problems, but I distracted it with peanut butter on the roof of its mouth. I’m wearing its blue V neck over my left pant leg as we speak. 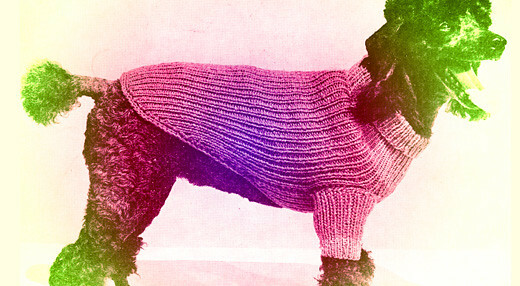 Now, at the end of the day, I stand before you clothed head-to-toe in dog sweaters. All shapes, all sizes. Tiny pom poms jangle at my wrist. Embroidered bones and fire hydrants dot across my waist. Mostly designer labels, and almost all of them the latest styles. I’m sure my outfit right now cost more than my wedding suit. The back of my knees itch like crazy. I think that damn Scottie had flees. But, it was worth it. I’m warm and content, euphoric in my ill-gotten gains. I feel like I could do anything right now. Though, for some reason, all I want is to dig under my neighbor’s fence and shut up that goddamn alley cat. I hate that goddamn cat.